In line with Ball State University’s new College of Health, the Health Professions Building is being built with a key word in mind: collaboration. In 2016 Ball State University combined several departments to create their College of Health. This collaboration was created to have different health professions students partnering just as they would in the real workforce. These Interprofessional Education (IPE) spaces are bringing together various disciplines and incorporating cross-training between departments to encourage students to work together. F.A. 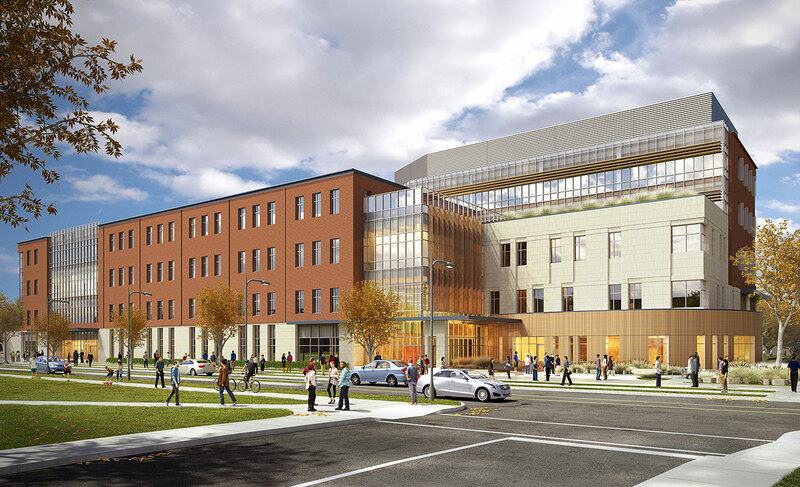 Wilhelm Construction is the general contractor for the new Health Professions Building opening this fall and housing nursing, speech pathology/audiology, social work, health science, nutrition/dietetics, counseling psychology, and kinesiology. The kinesiology program includes exercise science, sports administration, athletic training, and sports medicine, sport and exercise psychology, fitness leadership, physical education/teacher education, and pre-professional training for physical therapy, occupational therapy, medicine, and other health-related fields. A full functioning public clinic will be incorporated into the building and will be equipped with audio loops to help the hearing impaired. The hearing loop provides a magnetic, wireless signal that is picked up by hearing aids to help hearing impaired visitors better interact with the staff. The second floor of the building will include observation rooms for speech pathology and audiology students. These observation rooms will contain speakers, microphones, and cameras to help students learn and help parents review sessions, all while maintaining HIPPA health regulation compliance. New simulation suites will be housed in the building; these suites are set up like hospital rooms and designed to hold several patient beds. At each bed there will be mannequins that faculty members can program and control as students practice individualized care through progressing scenarios. “These mannequins are sophisticated and have the ability to replicate real life patients. That means students are getting real life training in controlled environments better enabling them for the real world,” said Kelly Knable, Director of Construction for Ball State University. Design elements were incorporated to inspire students to practice wellness both in the classrooms as well as in their personal lives. A wellness garden, IPE spaces, and a fully equipped demonstration kitchen are all unique features RATIO Architects incorporated into this design to encourage a feeling of wellness to students, staff, and visitors of the building. Ball State University prioritized the inclusion of sustainable elements in their new buildings. The Health Professions building features an abundance of natural light to create spaces where students want to learn. Solar panels are also included into the design of the building helping Ball State University define itself as a “Top Green University”. This building is on track to achieve LEED Silver Accreditation. As General Contractor, Wilhelm oversees and coordinates all aspects of constructing the Health Professions building, as well as providing self-perform services for excavation, concrete, steel erection, masonry and carpentry work, ensuring quality and timely completion. Self-performing enables Wilhelm to stay flexible throughout the project and guarantee students will be in the building this fall. “When you’re working on an impressive and impactful building it’s essential to have the right people on the job. We self-performed a wide variety of work to assure that no days were added to the schedule,” said Aaron Tague, Project Manager for F.A. Wilhelm Construction. The spaces and places where students live and learn have big impacts on their top school choices. Ball State University’s investment in their College of Health shows a dedication to current and future students – ensuring they have the best technology, learning environments, and collaborative spaces. The Health Professions building will benefit enrollment, create attractive learning spaces and places where students can live and thrive while attending Ball State University.